This is a little anthology of works, written and carefully hand-picked from the blog The Chattering Matterings of the Original Meekfreak by (full disclosure here) my good friend Lee Ju-Lyn. Ju-Lyn started her blog in 2005 as a creative space for her many wondrously imaginative essays, poems and short works of fiction. In 2008, she decided to self-publish All The People Imagine. I love that she did that. I am grateful for the ability to hold this selection of her best works in my hand. I don't personally know any other writer, but here's a little secret: When you know the writer, the knowledge transforms your act of reading. And then, having it on paper cements the tangibility of it. Her ideas, thoughts and sheer effort flowed almost visibly from the pages into my hands and into my head and into my heart. To me, the paper is incredibly light for the weight that it carries. This book demands that you disengage from reality. It features twisted fairy tales and love stories gone astray. Animals and plants are strangely human; they talk, teach and philosophise. This is the stuff of our dreams. Thus, the title. Ju-Lyn imagines, yes. But she's not the only one. People imagine. 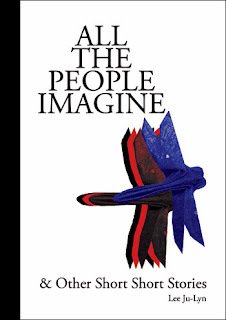 Indeed, all the people imagine, don't they? This is an invitation to embark upon a flight of fancy, open to all. At first it's weird. What would your first reaction be a story about a frog in a toilet bowl? But lean into the absurdity, and you'll find yourself surprisingly comfortable. Ju-Lyn says she's influenced by Magritte and other surrealist artists. This can plainly be seen in the subject matters of her choice. The lines between dreams and reality, logical and illogical, sense and nonsense, are blurred. The point is not what happens, but what interesting associations take form in your head when you read, for example, about the girl with a rambutan nose. I found myself feeling, overall, that my own existential angst was magnified (as I am sure was intended); but then, was curiously overcome by a sense of optimism, due in no small part to a narrative tone assuring me that although the good is bad, the bad is, in fact, good. One of my favourite stories is The Chicken Coup. It is a neat little piece rife with symbolism about the search for meaning and is a fine example of the clever use of animals to make an existential observation. With talking animals, nothing ever feels too serious - indeed the story was a pleasure to read - even though the observation itself may be somewhat bleak. Another of my favourite stories is Iced Honey Latte, a story within a story about a girl being so bored with life that she literally lost colour and became the greyscale girl. Incidentally, this story was also featured in Ceriph, Issue One. I remember Ju-Lyn handing the little blue Ceriph book over to me, mentioning in a nonchalant way as if it was really no big deal that a couple of her stories was featured in it. I passed a lazy couple hours thumbing through the collection, re-reading Iced Honey Latte and marveling once again at her pithy observation that red is the opposite of black. Think about it and you too will agree that it is so. And pretended to fall asleep. In typical Lee Ju-Lyn style, she hardly publicised the fact that the proceeds from the sale of All the People Imagine were donated to the Community Chest. She did not intend for the publication to be a profitable exercise. This book was a gift to me and to others in more ways than one. Books are soul food. Don't deny yourself the pleasure. Copyright © Vanessa Yeo. Simple theme. Powered by Blogger.